Norovirus is a highly contagious virus. Anyone can get infected with norovirus and get sick. Also, you can get norovirus illness many times in your life. One reason for this is that there are many different types of noroviruses. Being infected with one type of norovirus may not protect you against other types. Norovirus can be found in your stool (feces) even before you start feeling sick. The virus can stay in your stool for 2 weeks or more after you feel better. during the first few days after you recover from norovirus illness. There is no specific medicine to treat people with norovirus illness. Norovirus infection cannot be treated with antibiotics because it is a viral (not a bacterial) infection. 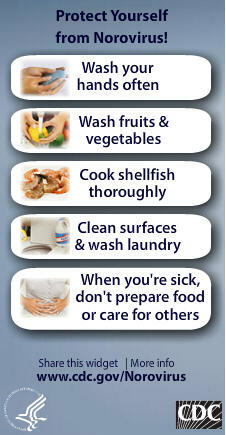 If you have norovirus illness, you should drink plenty of liquids to replace fluid lost from throwing up and diarrhea. This will help prevent dehydration. Sports drinks and other drinks without caffeine or alcohol can help with mild dehydration. But, these drinks may not replace important nutrients and minerals. Oral rehydration fluids that you can get over the counter are most helpful for mild dehydration.